Sleek straight hair is the most important part of my image. I’ve tried many amateur and professional devices for hair styling and learned that many of them require too much time. 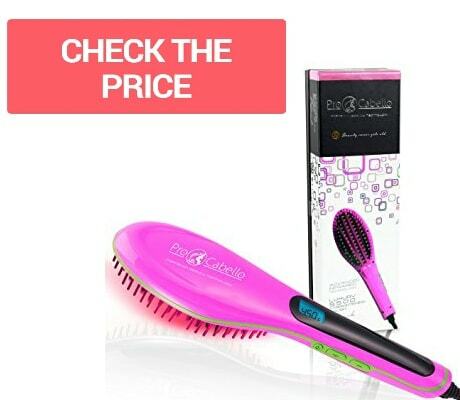 I found Procabello straightening brush accidentally when looking for portable hair straighteners in Amazon and purchased it because of its agreeable price. get hair locks out of the bun and comb through slowly and carefully. What appealed to me first is a smart and catchy design of Procabello brush. Being 14 inches long and 3-4 inches wide it’s small enough to fit my purse, and I think many girls will like its bright pink color. The box says it is also available in purple, black and white colors: it’s a good option for those who prefer a bit more moderate design. The brush straightener reminds of a regular oval hairbrush, and it has pretty long tourmaline teeth. The package contains an instruction that comes in handy for beginners, but there aren’t any other attachments. What I find particularly convenient is the form of this device: you can use it as regular wooden brushes, and you may keep it at any angle to brush through hair. Buttons are located on the side of the brush, so you can accidentally push them, and it happened to me twice. After reading Procabello straightening brush reviews, I realized I’m not the one dissatisfied with button layout. Be careful: there’s no auto-lock function to fix the temperature. What makes this device special is infrared technology that softens hair, helps to seal its cuticle and lock in hair color. This kind of emission helps to acquire silky, sleek and glossy hair within a few seconds. It took me about 10-15 seconds to go through locks of my hair once and have it completely straight! Negative ion emission inhibits the growth of bacteria and fungus, which helps to keep scalp and the brush clean and safe. Creators also claim that such energy makes small water particles enter the hair shaft and make it healthier. What I find particularly useful is rubber tips on the teeth. They don’t let the teeth burn or scratch your scalp, which is great! It takes the brush a couple of minutes to heat up to 450°F. 365° F is set by default, and it is good for delicate, fine hair. I prefer the 410° F mode, which works well with my natural brown hair. Ladies with coarse and wavy hair should choose maximum heating option 450°. There’s an LCD screen on the handle that shows the temperature at Fahrenheit only, so European users should get used to it. There’s an LCD screen on the handle that shows the temperature at Fahrenheit only, so European users should get used to it. Remember I mentioned I could put this brush in my purse? It’s not only compact, but it’s also lightweight. It weighs 1.7 pounds, so when I use it my hands don’t get tired, and I carry it with me almost everywhere. The cord is long enough for using it at home, hotel or hair salon. Besides, it rotates on 360 °, so you are free to use it as you like without being afraid that it may tangle or damage. Indeed, Procabello professional ceramic hair straightener is one of the most flexible and convenient devices I’ve ever used. Some say that the handle heats up, as well, but I didn’t have such problem. I don’t think users need protective gloves to use it, and rubber covering of tourmaline teeth makes it impossible to burn your scalp. By the way, that’s the reason why some women order this device for their teenage daughters. the device features 110 V to 240 V universal voltages. If you want to take it overseas, you don’t need a power adapter, so Procabello is the best option for travelers. What made me write this feedback is exceptional hair styling experience Procabello gave me. In comparison to flat iron a hair straightener brush, and some other straighteners, it doesn’t take much time to reach the desired result. I only needed to brush hair locks once with the Procabello, and they are ideally straight. From roots to tips. However, girls with short hair may find it difficult to operate: probably, a flat iron would be a better way out for them. Anyway, if you’re always in a hurry, and need to straighten natural curly hair in half an hour, it’s possible with Procabello straightening brush. Besides, it’s suitable for daily use, because tourmaline heating element does not damage hair structure. There’s one drawback that I noticed only a few weeks later: the brush does not have a hanging hook or holder. You can put it on a table while it’s working, but be careful. As I carry this in my bag pretty often, I don’t care about the absence of a hook. There’s no info about Auto Shut-off function on the box, unfortunately, so be careful when using the device and don’t forget to unplug it. There’s one more thing I want to mention. 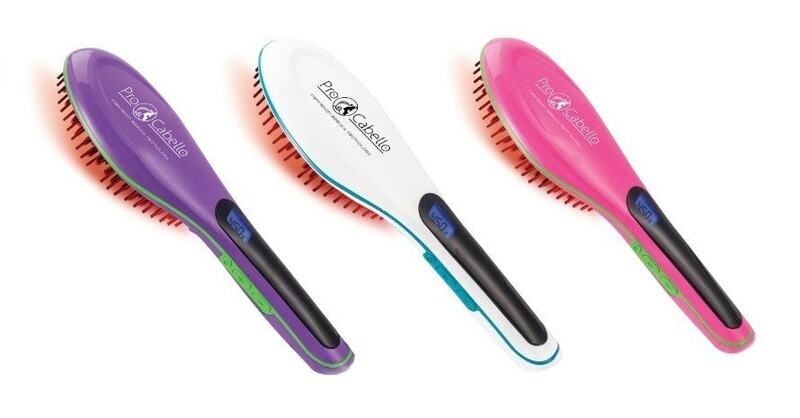 Some Procabello straightening brush reviews say that it takes much more time for the brush to work on wet hair. I’m not sure whether it’s a good idea to use it for damp hair at all: this way, high temperature may damage hair, and moisture can get into device making it unsafe. Dry hair and detangle them. Apply hair protectant, or coconut and argan oil. Make a bun on the top of your head. All in all, I would call Procabello brush a one-fits-all solution for girls who want sleek and straight hair in a matter of a few minutes. When I’m busy in the morning, I plug it in and straighten my hair in 15 minutes holding a cell phone in another hand. Convenient as never before! Rubber tips on the teeth make it absolutely safe even for young users. Have you tried Procabello straightening brush? Share your thoughts! Have any questions? I’m always ready to answer and give recommendations! I think where they put the on and off button is terrible because I accidentally keep turning it off. And I can’t tell you for sure that the corporate store is a rip off and everybody involved with this product including the people at the kiosk are horrible and they’ll be all nice to you to buy the product but as soon as it stops working they don’t know you. I wouldn’t waste my time because customer service is absolutely the worst possible. The kiosk people will not help you unless you have a receipt they tell you to go to the corporate store for a refund because you have a lifetime warranty. When you go all the way there they tell you you have to pay anyway for processing, What a joke because if you go to Amazon you can buy a brand new one for $10 cheaper so as soon as you see those people just go as far away from them as possible! I do not recommend you buying a thing in random places. Believe my words – that will help you to rid off numerous troubles. If it is about a household appliance, search for verified shops or internet platforms you have heard of or have checked already by yourself. Only then you can rely on qualified support from an expert. In case your switching-on button works from time to time, you should consult with a master – he will help you to find a solution. And before making a purchase on Amazon or another website do not forget to look for reviews to be sure your future commodity will not cause a problem.